It’s common for people to assume that only the aristocracy, gentry and middle classes educated their children (or at least their sons) until the advent of the Victorian period. That’s not really true. By 1700, Norfolk already had 37 endowed schools in existence, as well as a number of schools supported by charities. Most claimed to teach grammar and other useful subjects in place of the rigorous focus on the Greek and Latin classics in grander institutions like Eton, Westminster or Winchester. Most of these local schools were fairly small, perhaps with 10–20 pupils only. Others consisted of even smaller groups of pupils, whether supported by a charity or an endowment, living and studying in the home of the schoolmaster. Entry to charity and endowed schools tended to be by ‘recommendation’ from local clerics and other worthies. Once their education was completed, such poor children were given a suitable gift of clothing and then bound under an apprenticeship, the charity or endowment paying the necessary premium to their new master. Aside from genuine considerations of philanthropy, the purpose of all such schools for the ‘deserving poor’ was the same: to convert those who might prove to be a long-term burden on the parish into responsible adults able to earn their own way in the world. So, just as hospitals of the period were more or less exclusively for the poor—wealthier people would be treated at home—so endowed and charity schools were designed for those considered ‘promising’ whose families could not afford the cost of education. All children attending would be taught to read. Most boys would also be taught a little writing and arithmetic or simple book-keeping. Aside from this, the curriculum would be limited to useful tasks. Girls would learn needlework and household tasks. Boys would receive an education in whatever specific, practical skills the founder or charity thought necessary, from basic handicrafts to basic navigation. … to believe in God and serve him truly, to honour and obey the King; to submit themselves to all their Governors. … be careful not to disturb and unsettle that regular subordination of persons one to another. In other words, be industrious, work hard, help increase the prosperity of your masters and the city of Norwich and the country, but know your place. During the day, lessons were often subordinate to practical training in some craft, some children working thus for 12 hours or more. Spinning, weaving and the like was common in Norwich, since these were its main manufactures. In Yarmouth, children learned maritime skills and most were later apprenticed to go to sea or serve masters of maritime trades like sail-makers, shipwrights or anchor-smiths. Any children who made insufficient progress at school were either sent home or sent to the workhouses. 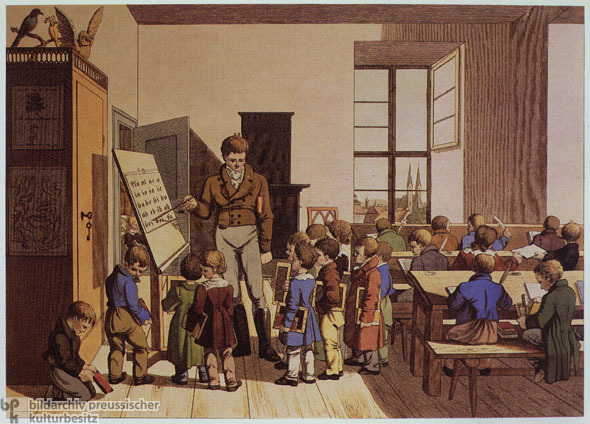 Grammar schools provided a fuller education but the entry of free pupils was gradually discouraged in many, so that they became instead fee-paying schools for the middle classes, regardless of the original intention of those who founded them. Some even came to insist that the term ‘grammar’ meant only Latin and Greek, a upheld in 1805 by a case judged by Lord Eldon and brought by the Attorney-General. By 1750, there could have been around hundred more schools in existence, both charity and endowed. The impetus now came in large part from the many dissenters in Norfolk and the growing Evangelical movement in the established church. Most were for boys, but girls were not excluded totally. All were aimed at combining an education suitable for earning a living with the inculcation of suitable moral and ethical values. Presbyterians in particular (later most groups became Unitarians) were convinced that the best way to avoid religious error, such as the traditional dogmas of the established church, would be the ability to read the scriptures for yourself. Combine this with an ability to use proper reason and you would produce a future generation dedicated to self-reliance, thrift, sober living and godly ways. And while the evangelicals in the established church disagreed with dissenters on doctrinal issues, their values in most other ways were identical. Endowing schools or establishing and contributing to educational charities became widespread. In Norwich, the Society for the Propagation of Christian Knowledge (SPCK) were active by 1700. There Norwich Charity Schools came into formal existence in May 1711, supported by a number of prosperous local people. By 1719, eight schools had been established for boys and four for girls, all using “the London Methods of Teaching” and supplying clothes as well as knowledge. According to Alderman Risebrow, a noted supporter, there were about 400 pupils. Many schools were being set up in villages and small towns throughout the county. By 1718, there were schools in nine small towns and larger villages. In 1727, records show that a pew in the parish church was reserved for the local charity school boys, and another one for the pupils of Gresham’s School. New small schools (6–12 pupils) had been set up by 1750 in 12 more villages, as well as larger schools in Norwich (several), Yarmouth, Swaffham, Mieham, Shipdham and Walpole St. Peter. In Norwich, two dissenting sisters, Joanne Scott and Dorothy Man, left money to teach 30 poor children “to read well” (and thus study their Bibles). Dissenters established a similar school at Yarmouth, while at Swaffham Nicholas Hamond left money to teach 20 boys, also “to read the English tongue” (i.e. not the usual education for the rich in Latin and Greek). New grammar schools were established at Norwich, Snettisham and Hingham. At Mileham, one Rev. Charles Ward added to a legacy from Allan Ellyn 100 years earlier and endowed a new school. New endowed and charity were a little fewer from 1750 to 1800, but this could have been because much of the demand had already been met. Nevertheless, substantial donations were made, from £700 at Baxton in 1754 (the interest to educate six girls locally and send six boys to school in a neighbouring parish) to £200 at Terrington St. Clements in the fens in 1763 and part of the tolls from the Lynn to Wisbech turnpike in 1783. So what was the picture at the end of our period? A Select Committee of Parliament reported on the education of the poor in 1819. Their returns showed some 344 parishes in Norfolk had schools and a further 76 had Sunday Schools. 284 parishes had no schools locally. In all, 26,326 poor children were receiving education, which was some 70 percent of the estimated school-age population. Not bad for 200 years ago. However, it was also plain that, by the century’s end, a good many endowed and charitable schools were finding their original endowments inadequate. When this happened, some closed or amalgamated. Others admitted more and more fee-paying pupils (i.e. middle-class children) until poor children were more or less excluded. Sadly, the poor, being destined for manual labour or service to some richer family, were no longer thought to need much education at all. Add to that the fears of revolution and radicalism engendered by the French Revolution, and you have a perfect recipe for replacing a belief in the value of education by one in keeping the masses in ignorant subservience. As the nineteenth century progressed, some education (in a strictly practical sense) might have been seen as necessary, but anything tending to “upset the regular subordination of persons one to another”, as stated by that Bishop of Norwich a century before, was still seen as entirely inappropriate.